i've been concentrating on slowly working two paintings these last few weeks. they have meaning to me, and i signed them yesterday and hope to get them up in the shop this weekend, along with "the seeker". this is a depiction of a pre-teen me with the barn that seems to be a childhood icon for me. it was my world of make believe; it was where i learned my first lessons of life and death; where i saw the hard work of my parents, and knew the simple pleasures of sweet, hay filled air when the loft was finally filled. this is my heart home. this was one i felt both drawn to paint and dreaded painting. i took this photo in july 2013, as we went to visit my daddy. i was happily surprised to see that it was hay day and the farmer doing the haying had parked his tractor in such a pleasing way next to the house. i loved the composition of the scene and the contrast of the red tractor with the white house. it was lovely. but it was my dads last hay season, and while this image holds that sadness for me it also gives me such pride of the life my dad built for himself and his family. he taught me a soft strength. he showed me how to be kind to all critters. and he taught me that there can be a heaven on earth. i'm very proud of these paintings, and i think they represent my feelings about my childhood the way i had intended. 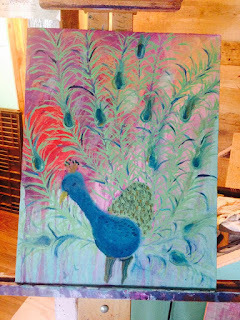 the next painting i have almost finished is an abstract peacock. i had started him a year or two ago but wasn't happy with him and let him rest. i'm finally almost done with this dude, and am pretty happy with his crazy and colorful plumage. i have not been doing much art other than canvas work these days. i want to play in my art journals and not have to worry about being 'on' all the time. my perfectionism isn't letting me do that, though, with my library show coming up. my head keeps telling me that because i don't feel well enough to paint daily, when i do feel up to painting it must 'count'. i feel i shouldn't waste my good moments to play on paper when i have a deadline. i want to have a good amount of canvasses to pick the best ones for show. it's a very silly mentality to have, but i'm ok with it. i keep telling myself that once february first rolls around i can play in my art journals all i want, and the way time is flying these days it's just a blink away!